FLORENCE, Ala. – Eighteen finished films and six unfilmed original screenplays have qualified for awards, prizes and audience recognition as the George Lindsey/UNA Film Festival celebrates its 17th anniversary on the University of North Alabama campus. This year’s festival – scheduled for Thursday, March 6, through Saturday, March 8 – once again combines public screenings, workshops, panel discussions, table readings and a gala awards show honoring professional, student and young filmmaker entries in the categories of narratives, documentaries and screenplays. “In its continuing efforts to support independent filmmaking and create the best possible festival experience for our audiences, we except a record number of filmmakers to be in attendance at this year’s festival representing their films,” according to Dr. Cynthia Burkhead, a UNA assistant professor of English who chairs the annual festival and film competition. This year’s film screenings – which are free and open to the public – will take place all three days of the festival in Room 131 of the UNA Communications Building on Pine Street, just north of Norton Auditorium. Awards and prizes will be presented the evening of Saturday, March 8, at UNA’s Mane Room performance venue, located at the intersection of Pine and Tombigbee streets in downtown Florence. Tickets are required for that event. Winners in the festival’s screenplay competition are announced in advance. The 2014 Feature Screenplay winner is A Second Last Breath, by Amanda Creiglow of Brooklyn, New York. Other finalists include Yellow Brick Road (by Alfredo Salvatore Arcilesi of Toronto, Ontario, Canada) and The Girl I Left Behind (by Stephanie Bain of Oxford, Alabama). The winner of the 2014 Short Screenplay competition is More Than Life, by Ashley Matteson of Warwick, Rhode Island. Death Expectancy (by Elisa Herrmann of Carbondale, Illinois) and You’re a Good Guy, Eli (by Cornelius Murphy of Winfield, Massachusetts) were named finalists in that category. The festival was founded in 1998 by UNA alumnus George Lindsey (1928-2012), whose long and versatile career in the entertainment industry included Broadway musicals, feature films, prime-time television and stand-up comedy. Lindsey earned lasting fame and audience adoration for his signature role as goofy, good-natured garage mechanic Goober Pyle on the beloved television 1960s-era sitcom The Andy Griffith Show and its spinoff, Mayberry R.F.D. 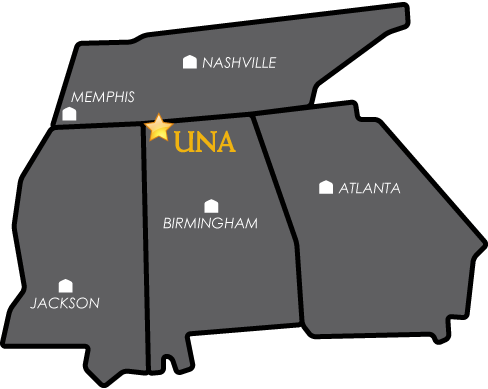 For more information on the 2014 George Lindsey/UNA Film Festival, call the festival office at 256-765-4592, e-mail lindseyfilmfest@una.edu or visit http://www.lindseyfilmfest.com.